The same 4.9-ton German half-track chassis formed the basis for a small armored reconnaissance half-track designated the Schutzenpanzerwagen Sd.Kfz 250. Like the larger Sd.Kfz 251, the Sd.Kfz 250 eventually served in a wide variety of roles. German industry would build 4,250 Sd.Kfz 250s between June 1941 and October 1943. The 18-ton (load capacity) unarmored German half-track coincidentally weighed 18 tons. It had a crew of nine and was 27 feet long, 8 feet 6 inches wide, and 9 feet 1 inch tall. The first production model entered the German army inventory in 1938. It would see service in a variety of roles including tank recovery vehicle, artillery-towing vehicle, and as a portable bridge-towing vehicle attached to German army engineering units. German industry would produce about 300 of these vehicles before the war ended. To improve the cross-country mobility of military trucks, German industry converted a number of wheeled vehicles from different manufacturers into German half-track trucks, called Maultiers (Mules). This modification replaced the vehicle's rear axle and wheels with a tracked module. Many of these half-track trucks featured the suspension components from the Panzer II light tank. The first of these vehicles appeared in late 1942. Production ended in 1944 with a total of 4,000 Maultiers produced. The usefulness of the Maultier concept convinced the German army to produce an armored variant weighing 7.1 tons in 1942. The official designation was the 15-cm Panzerwerfer 42 auf Sf (Sd.Kfz 4/1), of which 300 were built by the time production ended in March 1944. The armored version of the Maultier carried a 10-barrel Nebelwerfer (rocket launcher) on its rear superstructure. The rocket launcher, consisting of two horizontal rows of five barrels, was mounted on a turntable with 360-degree traverse. The high-explosive rockets fired from the launcher unit weighed 78 pounds and had a maximum range of 7,330 yards. The rockets were fired electrically by a gunner who sat inside the vehicle. In the late 1920s, the German army began development work on its first generation of post-World War I Panzerspaehwagens (armored cars). Standard German army practice was to dispatch three German armored cars on a reconnaissance patrol. The patrols would normally last from one to two days. At least one of the armored cars would be equipped with a powerful radio. The Germans would also send an artillery observer along with the patrols to call in emergency fire when required. The primary job of German armored cars assigned to reconnaissance missions was to seek out information on enemy troop dispositions and pass it on to higher commands. If an enemy force was met during the conduct of such patrols, action was to be avoided at all costs unless the enemy force was so weak that it could be destroyed without diverting the patrol from its main job. If the Germans anticipated that their reconnaissance patrols would meet enemy resistance, they would be reinforced with self-propelled assault guns and occasionally with German tanks. Engineers and motorcyclists could also be attached to reconnaissance patrol to deal with roadblocks or minefields. The first German armored cars to be fielded was the six-wheeled, 5.7-ton Sd.Kfz. 231 (6-Rad) armored cars. (In German army nomenclature, any vehicle with more than four wheels was distinguished by the inclusion of the words "6-Rad" or "8-Rad," indicating a six- or eight-wheeled vehicle.) It was 15 feet 9 inches long, 6 feet 5 inches wide, and 5 feet 7 inches tall. Between 1932 and 1937, 151 vehicles were produced. The vehicle was based on the chassis of a commercial truck and was operated by a crew of four. The engine was at the front of the vehicle. The main armament consisted of a turret-mounted 20-mm gun. The secondary armament was a coaxial 7.92-mm machine gun. The Sd.Kfz 231 (6-Rad) saw service during the invasions of both Poland and France. Due to its poor cross-country mobility, it was restricted only to training duties after 1940. 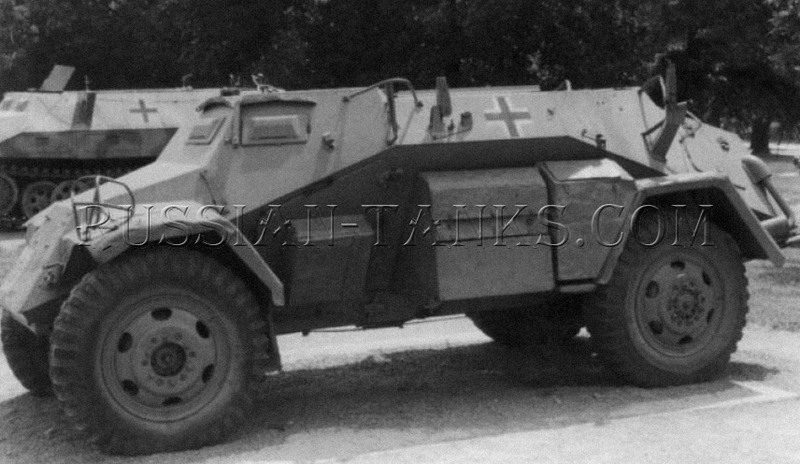 The replacement for the Sd.Kfz 231 (6-Rad) was the purpose-built Sd.Kfz 231 (8-Rad). Like its predecessor, it had a four-man crew. Development of the vehicle began in 1935, and the first production vehicle was turned over to the German army in 1937. The Sd.Kfz 231 (8-Rad) was 19 feet 2 inches long, 7 feet 2 1 /2 inches wide, and 7 feet 8 inches high. The Maybach gasoline engine was located at the rear of the vehicle. At the time of its fielding, the 8.3-ton Sd.Kfz 231 (8-Rad) was the most advanced cross-country vehicle in worldwide military service. It incorporated all-wheel drive and steering, and front and rear driving controls. The initial version of the Sd.Kfz 231 (8-Rad) was armed with a turret-mounted 20-mm gun and a coaxial 7.92-mm machine gun. 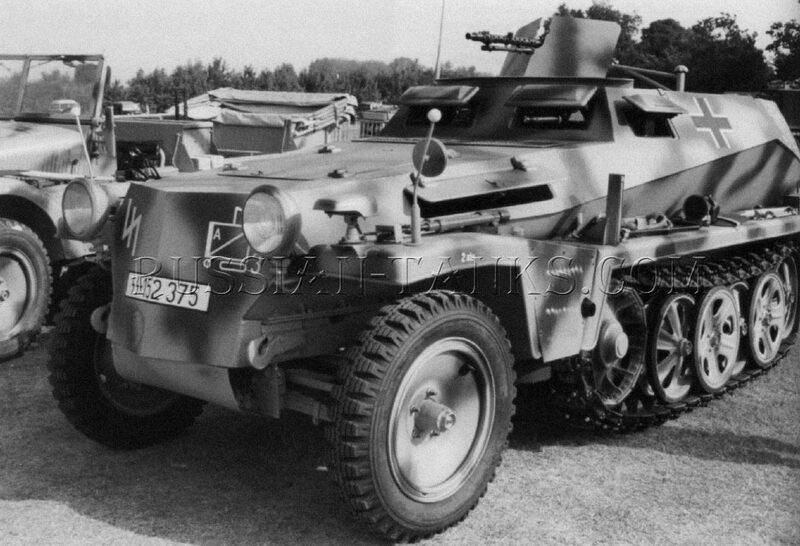 The command variant was designated Sd.Kfz 263 (8-Rad).